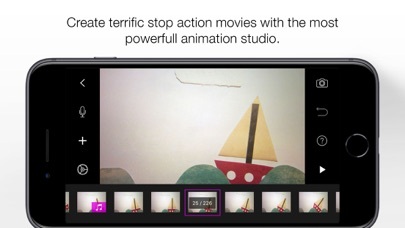 Get Stop Motion Studio, the world’s easiest app to get you into stop motion moviemaking today! 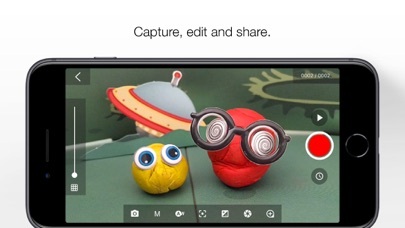 ****************************************** As seen on Apple's TV commercial “Life on iPad.” Stop Motion Studio: Check out the buzz... "This app has lots of attractive features, making it super easy to get into stop motion video. You’ll have a lot of fun playing with it.” -Best10Apps.com “With a little creativity and a lot of patience, there’s much fun to be had with this app! Check it out. -FOX-News: Tapped-In “...for satisfying the inner animation producer in all of us.” -148apps.com “It includes some exciting features.” -AppRecap “Let's Make a Movie!” -technewsworld.com ****************************************** Want to create movies like Wallace and Gromit or those groovy Lego shorts on YouTube? Then this is the app you’ve got to add to your collection. 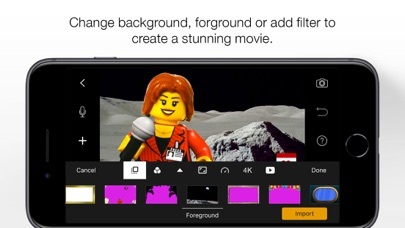 Create beautiful stop motion animated movies anywhere instantly on your device. Everything you need is right at your fingertips. No computer needed. It's simple to use, deceptively powerful and insanely fun to play with. Create fantastic movies your friends will enjoy or share it with the world on YouTube, Facebook and other sites. Cool themes, titles and sound effects are easy to add, too. Stop Motion Studio helps you to create terrific stop action movies with a whole host of unique features: • Overlay mode to show you the differences between frames for precise control • Grid mode to position animated objects more easily • Ability to use the volume button on your device to capture images • Integrated movie editor with frame-by-frame preview at different speeds • Cut, copy, paste, delete and insert frames at any position • Automatically capture frames with an adjustable time interval feature • Zoom in and out on the timeline view so you never get lost, even if you have hundreds of frames • Fade your movie in or out for a professional look Do amazing things*: • Create movies in Ultra High Definition with four times the resolution of Full HD. • Import pictures from your photo library into your movie. • Remote Camera: Get a new perspective! Use your iPhone, iPod or iPad as a remote camera connected via a Wi-Fi. • Movie Effects: Choose from seven amazing effects to give your movie an extra-creative professional touch. • Green Screen: Change the background of your scene to make the figures you capture fly or appear anywhere you can imagine. • Rotoscoping: Import video clips and create stunning animations by painting over it. Themes* • Add movie titles and credits using eight different themes. Or choose from 28 amazing theme and text cards. • Choose from more than 30 different front- and background images. Image Editor* • Colorize your movie with different paint tools and paint directly onto the image. • Crop, rotate or flip an image the way you like it. • Use the magic eraser to magically erase unwanted parts of the image. • Merge frames together to simulate fast movement. Full Camera Control • 4K Ultra High Definition, 1080p and 720p. 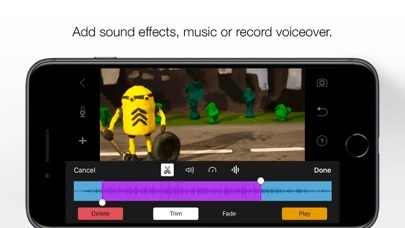 * • Camera zoom • Automatic or manual white balance, focus and exposure control • Cinema Mode (2.35:1) Record Audio or Add Music • Bring it all to life using sound effects at virtually any position in your movie. Choose from more than 80 music and sound samples* • Add music from your own song library to your movie • Record audio or voiceover directly to your movie • Adjust the volume of any sound track • Import audio from Dropbox or any other app. Export • Export your movie in up 4K UHDTV quality • Export as animated GIF • Export in square format for Facebook or Instagram • Export all images • Project Import and Export Share Your Movie on the Web and in Your Home • Publish directly to YouTube, Facebook, DropBox or iCloud • Transfer your movies to your computer • Built-in parental controls to manage access * Optional feature. Requires in-app purchase. All features are already included in Pro version. By I think it's good. When I checked it out it said free when you use it and take photos try to put them in guess what u pay for it even sound cost money. I enjoy using stop motion because you can edit scenes to add special effects easily! 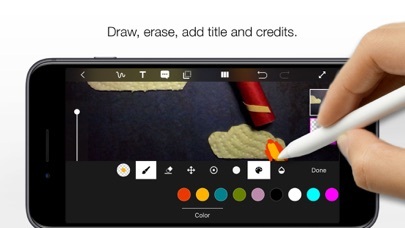 My only wish for stop motion is that they will update it so you can insert pictures in the editing section and also add a erasing tool for the picture to erase unwanted bits. I was also wondering how to get my projects on the gallery.